Last time we had fun with the flying kite. Today you are like a magician can bring your kid’s favourite game “Angry birds” to real life for fun all summer long. All you need – a few plastic balls, permanent marker and many cardboard boxes. Of course you can buy angry birds outdoor action game. 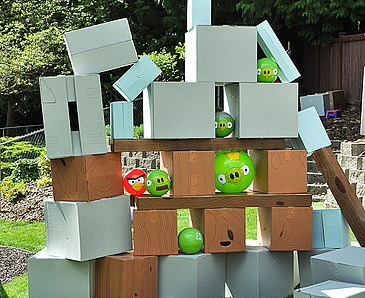 But if you want to have real fun with your kids try to create home-made Angry Birds game. They can help you to paint on the bird and pig faces with the permanent marker, build a castle using cardboard boxes in your backyard. In order to make the game more colourful, you can paint some boxes in different colours. For those who need expert help find a drawing sketching tutor. The kids have to toss the angry birds at the pigs and to knock the structure down. And everyone else will have fun watching them play or playing as well. This entry was posted in summer break and tagged angry birds, kids, parenting, summer, summer break, tutor, tutorz. A totally cool game, Maya Kacharava! I even would want to play it myself.